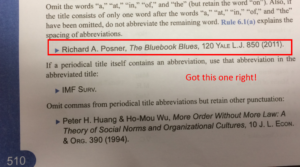 Richard Posner doesn’t like the Bluebook. He has railed against it for years, devoting entire articles in the University of Chicago Law Review (1986) and the Yale Law Journal (2011) to the horrors of what he deems an ever-growing monstrosity. 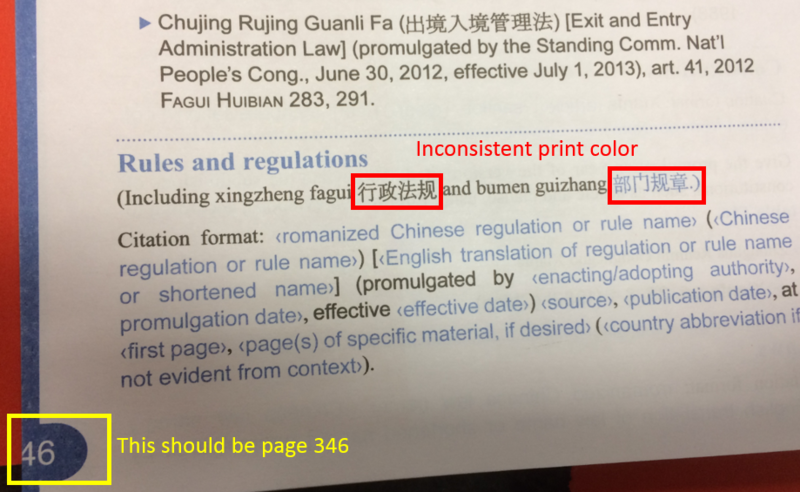 In a December 2016 article for Green Bag, Judge Posner stated that among the reforms he would implement at federal appellate courts, “the first thing to do is burn all copies of the Bluebook, in its latest edition 560 pages of rubbish”. Well, one person’s rubbish is another person’s treasure. Enter the Bootleg Bluebook. Say what? 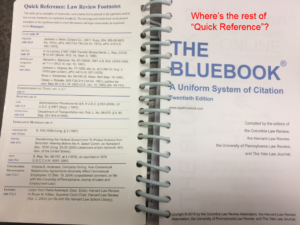 Of all the things to make knockoffs of, why the Bluebook? It isn’t a literary bestseller like Harry Potter and it sure as heck isn’t Louis Vuitton. Even the Kelley Blue Book would seem a likelier candidate for a fake. Then again, with over 35,000 students matriculating at ABA-accredited law schools annually, the built-in demand means that a lot of Bluebooks are sold every year. Unfortunately some BLS students who bought Bluebooks through third party vendors have been victimized by these fakes. 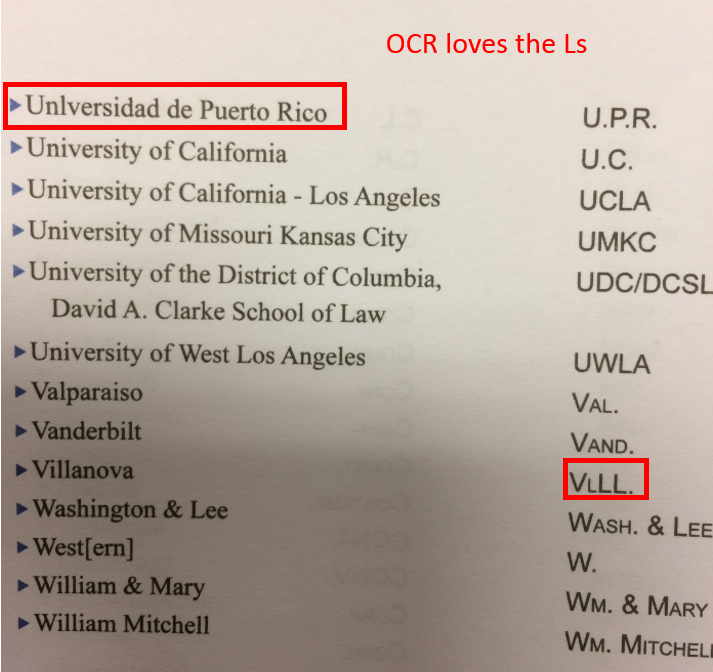 We’ve heard that students at other law schools have run into this problem too. 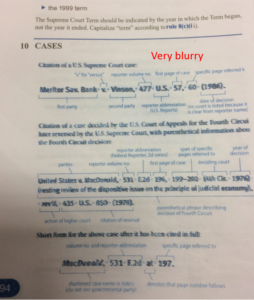 Imagine a student at Any Law School, U.S.A., meticulously poring over the Bluebook to make sure everything is cited correctly for their first legal writing assignment. 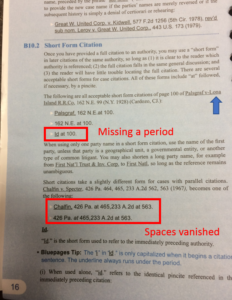 Only to get his or her paper back, marked up to the hilt with corrections in red ink. 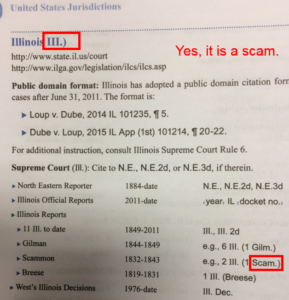 I feel for students who are using the Bluebook for the first time only to find out that their trusted source was a bootleg. Fake news we can handle. 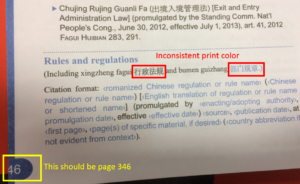 But fake Bluebooks? One of the BLS students was kind enough to lend us their bootleg copy. 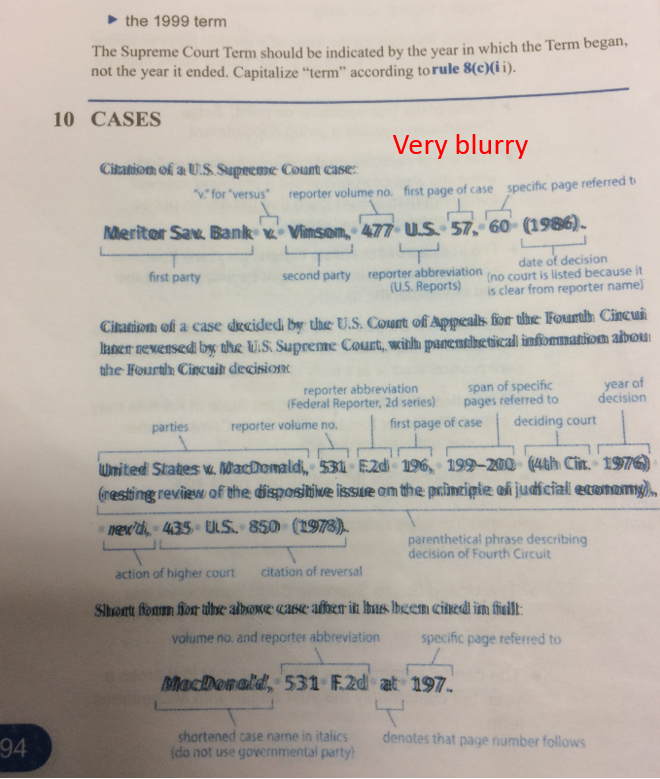 It’s basically a case of OCR gone bad. 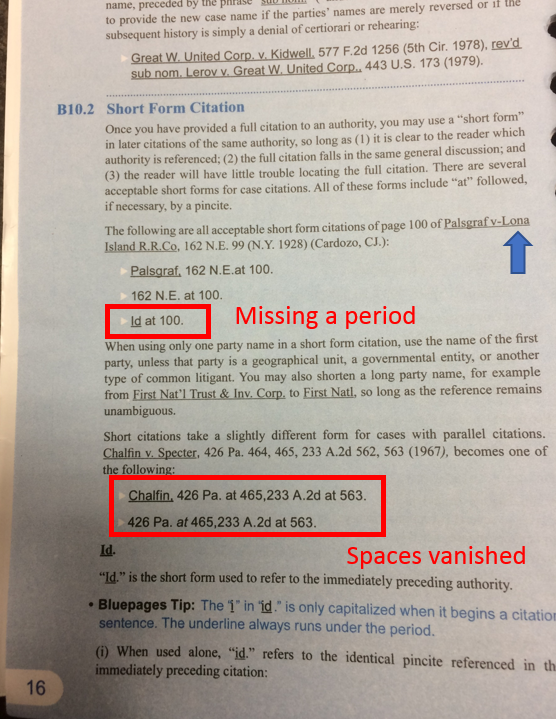 Periods vanished, text out of sync, commas turned to periods and vice versa, blurry text, off-kilter page numbers, and the most common error: missing spaces. New jersey losing its capitalization and making you think of swag rather than state — while the III for Illinois makes you want to yell “My kingdom for a horse!” Interestingly, the Chinese and Japanese characters seemed to be in good shape, though the bootleggers couldn’t decide what color print to use and kept switching back and forth between black and blue. 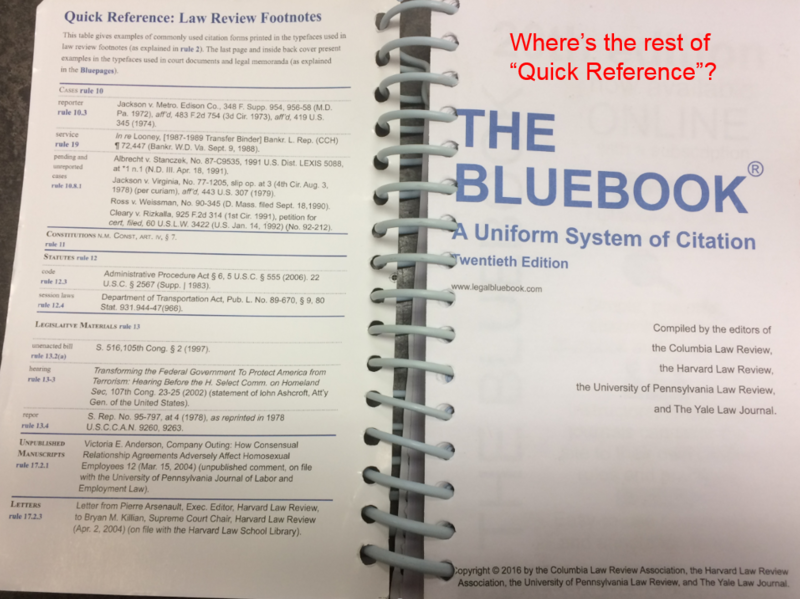 So the Public Service Announcement for today: It’s best to get your Bluebook directly from the publisher or from a trusted retailer, rather than through a third party vendor. 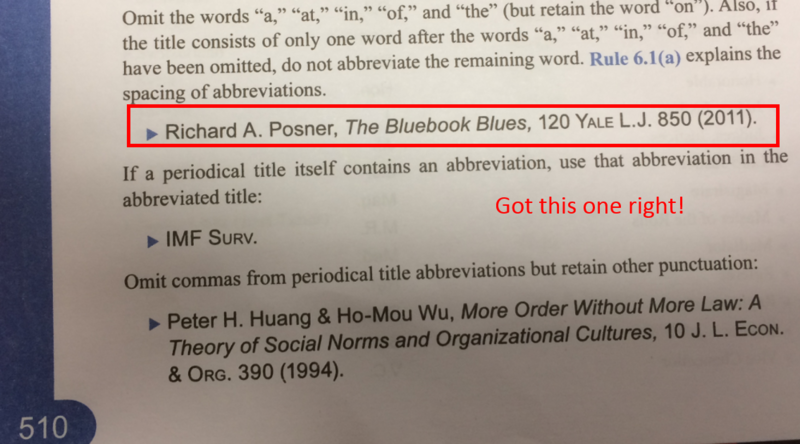 Richard A. Posner, The Bluebook Blues, 120 Yale L.J. 850 (2011). 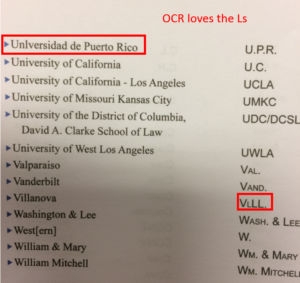 This entry was posted in 1Ls, BLS Students, Blue Book, Brooklyn Law School, Legal Writing and tagged Fake News, Richard III, Richard Posner on November 10, 2017 by Eric Yap.